In 1930 the ‘great race’ began. 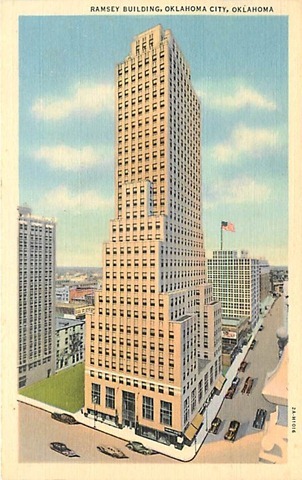 Construction began on both the Ramsey Tower and the First National Bank Building. Two buildings to change the Oklahoma City skyline. The race was to see which building could be completed first. The Ramsey Building barely won. 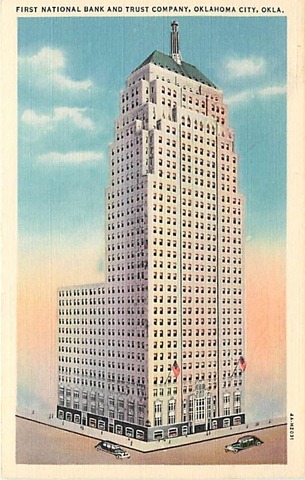 Both buildings have the same number of stories but the First National Bank Building became the signature building on the skyline. It is similar architecturally to the Empire State Building. Today, the Ramsey Building is called City Place. The First National Bank went bankrupt in 1985. The First National Center is an art deco masterpiece. The Grand Hall which was the bank lobby is full of marble and was just gorgeous. The partnership that purchased the First National Center in 2006 for $20 million, filed bankruptcy this month.